The plantar fascia is a ligament-like band running from your heel to the ball of your foot. This band pulls on the heel bone, raising the arch of your foot as it pushes off the ground. But if your foot moves incorrectly, the plantar fascia may become strained. The fascia may swell and its tiny fibers may begin to fray, causing plantar fasciitis. 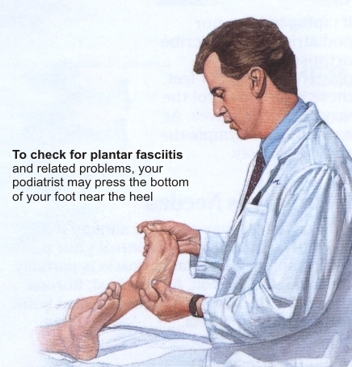 Plantar fasciitis is often caused by poor foot mechanics. If your foot flattens too much, the fascia may overstretch and swell. If your foot flattens too little, the fascia may ache from being pulled too tight. With plantar fasciitis, the bottom of your foot may hurt when you stand, especially first thing in the morning. Pain usually occurs on the inside of the foot, near the spot where your heel and arch meet. Pain may lessen after a few steps, but it comes back after rest or with prolonged movement. A heel spur is extra bone that may grow near the spot where the plantar fascia attaches to the heel. 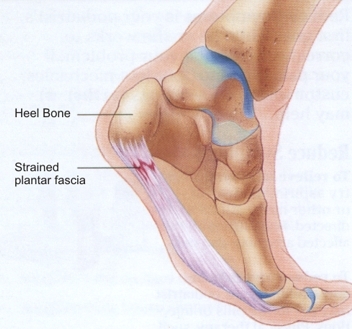 The heel spur may form in response to the plantar fascia's tug on the heel bone. Bursitis is the swelling of a bursa, a fluid-filled sac that reduces friction between a ligament and a bone. Bursitis may develop if a swollen plantar fascia presses against a plantar bursa. Where and when does your foot hurt? Your podiatrist may first ask about your symptoms. Then he or she may feel for damaged ligaments, inflamed tendons, and displaced bones or joints. Your podiatric doctor may also watch you walk to see if your symptoms are caused by incorrect foot movement. Testing X-rays of your foot may be taken, or you may have a bone scan to confirm a suspected heel spur or a stress fracture of the heel bone.